Shown here is a photograph from the "Unlocking the Diary" exhibit ,on display from December 3, 2010-March 31, 2011 in the third floor rotunda gallery inside Swem Library at the College of William and Mary. The diaries in our exhibit span the 19th and 20th centuries, and our discussion of the diary brings us into the present day. Our first case, “What Counts?,” introduces you to the range of forms and styles of the diary. “Life in Transition,” our second case, demonstrates how the diary has been used throughout the life cycle by both women and men. “Through Their Eyes: Diarists in Virginia” looks specifically at diaries written by 19th-century Virginia women and our final case, “DiaTribe,” features diaries written by William & Mary students, from the first years of female enrollment at the College to the present day. This exhibit was curated by students in Prof. Jennifer Putzi’s “Gender and the American Diary” class (WMST 490/ENGL 475) and the Special Collections Research Center staff. All of the diaries and artifacts featured in the exhibit are from the SCRC collections. Student Curators: Kaitlyn Adkins, Greg Benson, Kimberly Clark, Caitlin Finchum, Greg Glazier, Katelin Hill, Shaunna Jardines, Katherine Perkins, Cassie Adair, Ryan Morris, Kali Murphy, Taysha Pye, Sta’sean Ridley, Casey Sears, and Errin Tom; Exhibit design and installation: Chandi Singer, Burger Archives Assistant. Writing in diaries is not something that has been relegated to adolescent teens; people here at William & Mary have been writing in journals for many years. This case not only represents the personal narratives of the three students highlighted, but represents a general narrative of the university itself. This case displays diaries by three different students, representing various time periods: Martha Barksdale, one of the first women to attend the college in 1918, Margetta Hirsch Doyle, a woman who attended in the 1940’s, and a student currently enrolled at William & Mary. Margetta Hirsch Doyle Diary, 1943. Margetta Hirsch Doyle attended the College of William & Mary from 1941 to 1945. Her diaries record her experiences as a student and include photos of her close friends. This diary is pre-printed with one day per page, and is the second of four volumes. Margetta Hirsch Doyle Diary, 1942. In this diary Hirsch Doyle writes of her experiences during the summer prior to her sophomore year at William & Mary. Her writing includes descriptions of media, social context, and student life during the early stages of World War II. Hirsch Doyle explicitly states her intentions in keeping a diary in her first entry’s introduction. In this she recounts her involvement with William & Mary while also bringing up concerns about the inception of World War II. Much has happened since I last wrote in a diary. Almost a year has passed -- a year in which two noteworthy events occurred. In regard to my personal life, I have completed my first year of college at William and Mary. I’ve had my ups and downs, but all in all, I’ve been very happy. I pledged and was initiated Kappa Delta, made Dean’s List, was on the Editorial Staff of the Colonial Echo, our yearbook, did secretarial work for the school newspaper, was elected Secretary of the Foreign Travel Club, did airplane spotting for defense and above all made many wonderful friends. That all sounds rather insignificant thought when you think of the other “noteworthy event.” On Dec. 7, ‘41 the Japs bombed Pearl Harbor, Hawaii and on the following day, the United States was at war with Germany, Italy and Japan. War is a horrible thing! While it was still being fought mostly in Europe, we hadn’t really been affected much and most of the time, I doubt if we realized just how terrible it was. The worst part of it all, too, is that the better things are just beginning to happen. We have so much to face yet. Gas and sugar rationing, priorities, are just a small phase of it. The Great White Way of Broadway is dimmed out and we have periodic practice air raids and blackouts to prepare us for the time -- awful thought -- when the real thing comes. We seem to be losing the war on all fronts and our boys are constantly registering being drafted and then -- who knows? Casualty lists are long. As yet I’ve been spared having anyone I know’s name appear on them. I hope I’ll always be spared that. This summer has been an eventful one. I’ve had so much fun and done so many wonderful things since I’ve been home from college that I feel as if I want to reach out and hold on to every precious moment lest it slip by too quickly, without returning. Perhaps if I write about it, I may be able, in some way, to keep some of the memories alive. It’s hard to know where to begin my reminiscing and where to start keeping a daily diary, but July First is far enough back to include many wonderful things and yet not so long ago that I can’t remember it all. So here goes! The diary of Martha Barksdale from her first year at William & Mary records major campus events and chronicles her relationship with a suitor in later entries. Barksdale’s diary provides a woman’s perspective on early coeducation at William & Mary. In this excerpt from Barksdale’s diary, she recounts events that appear constantly throughout the text; games of basketball and the men of the college “calling” on the women. One evening we had a match game of basket ball to cheer Miss Gatling and incidentally ourselves. Celeste and Florence were the capitans. I played jumping center, by boys’ rules against Louise Reid and shot the first and only goal thus winning the game for our side. This started my basket ball “rep” here, and I only hope I can keep it at its present glow. Soon after the quarantine the Lieutenants and a few non- coms came over one night. This started our social hour. Since then the boys come over everynight until call to quarters or on Sat. and Sunday until 10:00. I have met some very nice boys but don’t enjoy it much because dancing has been the chief amusement. This audio diary was kept by Shaunna Jardines, a college student at William and Mary in 2010. Today is Tuesday, September 14th 9:40 pm and this is my third video diary entry for my English course. I am really tired… I just... I'm still at work right now. Ummmm we were short today for aids... still had to do showers... it’s Tuesday. 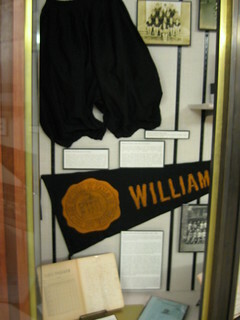 From the Special Collections Research Center, Earl Gregg Swem Library at the College of William and Mary. See swem.wm.edu/scrc/ for further information and assistance.